On this page we are collecting our very own press archive. It will include any interviews we give, work by other people which references us and press mentions we get. If you want to give the WLM Music Archive some media coverage, we’d be very happy – please let us know so we can add you to this page! 2016: WLMA was interviewed for Sonic, Sweden’s number one music magazine, in their annual ‘end of the year’ issue for 2016. April 2014: WLMA was invited to talk on Out in South London, Resonance Radio’s LGBT Arts Programme. Thanks to Rosie, Sabine and the team for the chance to spread the word about the archive, and play some of the music! In a Guardian Comment Is Free article on 26 June, 2013, Anya Pearson conducts a clever experiment to visually represent the issue of gender inequality in music by editing the posters of ‘some of Britain’s best-loved festivals deleting all the acts with no female members … The results are as striking as they are shocking: blank spaces flood what would otherwise be a crowded list of artists.’ And she provides a link to the archive, as her mother is a member of the much-loved Stepney Sisters. Thank you Anya! 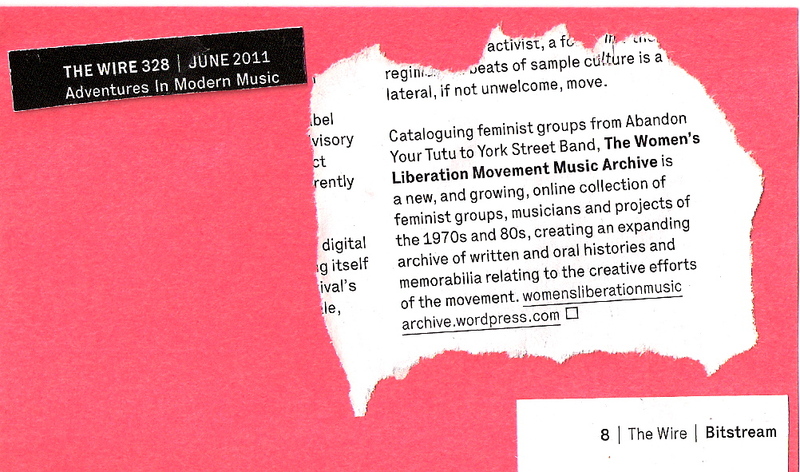 The Women’s Liberation Music Archive features in The Guardian on Sunday, 11 March 2012 in an article by Alexis Petridis – to read it click here. Deborah Withers talks to Jayne Chard from ShoutOut radio on Saturday 9 July 2011 about the WLM Music Archive. With discussions of and excerpts from the music of Ova, The Fabulous Dirt Sisters and Jam Today. the girls are – a UK-based independent online music magazine, celebrating and supporting women in music blogged about us, 2 June 2011. Read all about it here. Jenny Woolworth has included a post about us on her blog. May 19, 2011. Frankie Green talking on ‘Camp Universe City’ on NTS radio, 5 May, 2011. Thanx to everyone who has tweeted and blogged and posted about and linked to us, much appreciated! Just linked to it now. Glad you like it!